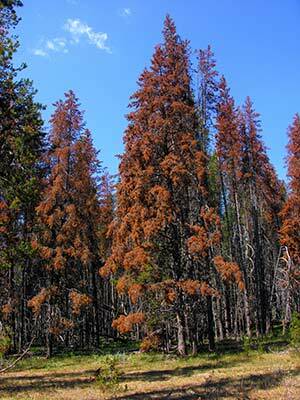 One Response to Lodgepole pine and the mountain pine bark beetle, and fire . . Thank you for this informative article. I was aware of the bark beetle’s presence and the role it plays in forest decline, if you will. But I didn’t know its size or “lifestyle” in the grand scheme of forest biology. I was also unaware of how the bluestian fungus was introduced. I have seen it in the wood but wondered what caused it. I do agree that the forest may be “calling” out to fire for replenishment in this way. Kind of adds a little to my aguments of the past in which I claim that the fires are needed for the Ponderosa to have a “next generation seeding”. This info is truly helpful in understanding the issue from a broader perspective. Though clearcuts may seem to be an answer to the fire/beetle/live vs dead trees issue, however, I object to them for their contribution to the extention of human encroachment on what’s left of nature and the fact that humans are in denial about their having exceeded the earth’s carrying capcity for their specie. Where humans came up with the idea that they could improve on the workings of nature has always been a mystery to me.